For two years, I’ve watched rain pour off the roof of an old shed in our orchard and hated to see it go to waste. And our vegetable garden is only about 20 yards from the shed, so it just made sense to capture some of the water. This weekend, as storms approached, we got around to adding rain gutters to the back of the shed to catch some of the precious rain in a barrel. I love this old shed. We use it for storage, but it had no rain gutters for all of the runoff. First of all, this was a relatively easy and inexpensive project. We already had the barrel, which cost about $80, in the shed. One of the drawbacks of the barrel type is that it tends to leak along its outside seams. Tim caulked and duct taped it for safe measure. The gutter, outlet and brackets came to about another $60. We had old hoses to reuse. The metal gutter Tim bought matches the barrel and the shed, so it doesn’t affect the character of the shed much. We attached it to the joist beams along the back, just under the roof. See how close all that wasted water is to the garden? Tim picked up two pieces of metal gutter, which covered most of the 24-foot roof, some slip joints to connect pieces, two end pieces and the outlet. The most time-consuming part of the project was bending the metal gutter pieces to fit together. Then we caulked them. We used metal brackets to connect the gutter to joists on the shed. Some of the joists were beginning to rot at the top, so we connected the brackets to the strongest ones and then reinforced the gutter with screws in other spots. Metal brackets secure the gutter on both sides every 18 inches or so. We sat the barrel on a found, fairly flat rock for some ground clearance around the lower faucet control and plugged the other hole with PVC pipe (this barrel also had a busted faucet). I’ll only be needing the hose connection. The garden is downhill from the barrel, which makes the hose flow more easily. And we stacked a few rocks around the sides of the barrel to help with drainage and mud control from overflow. Because the ground was so high in relation to the back of the shed, we haven’t bothered yet with a downspout; the outlet is only a few feet from the top of the barrel. We figured that if it missed, we could repurpose some old gutter we cut off the house when fitting barrels on it. But we found out that wasn’t necessary! When the rain came, it flowed right into the barrel and filled it up. 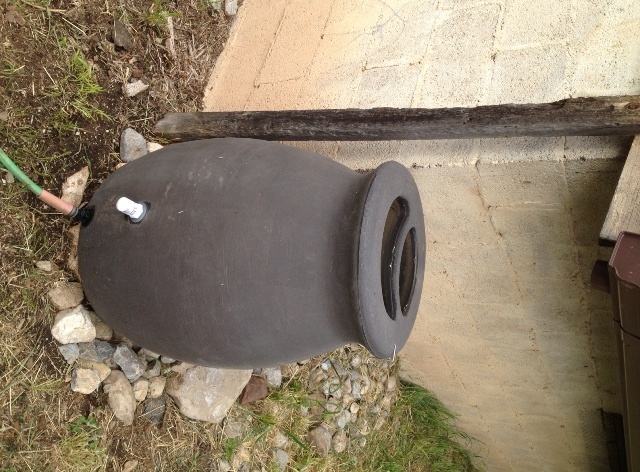 The barrel installed and filled to the brim after nearly an inch of rain later that day! I realize this barrel won’t hold enough to water my garden all of the time, but it helps. And if it works well, we might chain another barrel to it next year. I don’t worry too much about using water from the metal roof on my vegetables. First, I water the soil, not the plant’s leaves. Second, there has been plenty of research done on safety of rain barrel water for edibles. We don’t have pollution where I live, and I’m using well water if I don’t use rain water, so it’s not like I’m choosing water from a roof over city tap water. I make sure I rinse all harvested food. This was a fun, easy and rewarding project. With the rain we received, I haven’t had to use the stored water yet, but I’m sure I will need it by the end of the week! Next PostNext Perennial or Annual?